These days, lanolin may not be the only thing in wool that makes your skin soft, and wearing silver doesn’t just mean jewelry! Some people will remember predictions about ‘clothes of the future’ that would never need to be laundered because they shed dirt and wrinkles. In fact, the 1951 movie “The Man in the White Suit” explored the unintended consequences of just such an invention. I should point out that the movie predates me, so it’s no wonder I didn’t realize that it was nominated for both a BAFTA Award (1952) and an Oscar (1953)! I’m going to have to track it down and watch it one of these days… but I digress. The reality of today’s high-tech clothing-in-development includes “fabric which includes ‘firming active ingredients’, [which] is said to improve the elasticity and brightness of the skin.” Cosmetotextiles like Eurojersey’s Sensitive Ultra Light Firming, if they prove commercially viable, will no doubt usher in a rash of similar products in fairly short order. How soon will we see ads for overnight face masks that are really masks? Ugh. Other recently-introduced fabrics claim to “generate wellness and well-being to the consumer through state of the art cosmetic microencapsulation”, provide slimming effects, or deliver therapeutic substances, potentially including some drugs. Another Eurojersey product, Sensitive Bodyware, is intended to keep the wearer fresh and comfortable all day, in part because of an interesting property of silver. The precious metal not only adorns the wearer as jewelry, but also inhibits the growth of odor-causing bacteria, via a silver-based solution in this case. All this high-tech science is well and good, but spinners have been delighting for centuries in the softness of their hands after working with wool. While some people may not appreciate lanolin’s scent, I think the fragrance and gleam of lanolin on a freshly-sheared fleece is pure luxury! Silver, while pricier than grease fleece, is still not out of the reach of the average knitter. There are several yarns currently on the market that include silver not primarily for its antibacterial benefits, but for its sparkle! 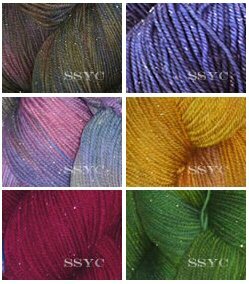 A couple of superwash sock-weight yarns are Dream In Color’s Starry and Kraemer’s Sterling Silk and Silver. 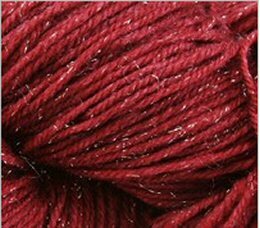 Both are advertised as 2% silver, and while Starry is 98% merino, Kraemer’s yarn has 20% silk plus 15% nylon for abrasion resistance. Both are in the $20 – $25 price range per skein, enough yarn to make a pair of adult socks, but who would want to hide that gorgeousness inside shoes?? My favorite color – so far – is Starry in Bermuda Teal. 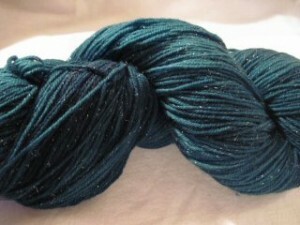 I also bought some Smooshy, the no-silver version, in the same color so I might be able to make a whole sweater. One of these days, I’ll have to stop petting and admiring it, and decide what to make with it – you can bet it won’t be socks, though!